Chatbots are a big trend in 2016. Some say that chatbots are the next websites and apps – there appear more and more chatbots successfully helping various businesses do their job in an easier way. But why would users prefer chatbots to websites and apps that can accomplish the same tasks? That’s the question we’ll try to answer today. Today, people use apps to satisfy specific needs. Over the past seven years, app marketplaces have filled with all kinds of apps for shopping, travel, socializing, dating, delivery services, music, and so on. It’s nice to have such a variety of apps, but according to recent statistics, people aren’t downloading new apps as often as they used to. 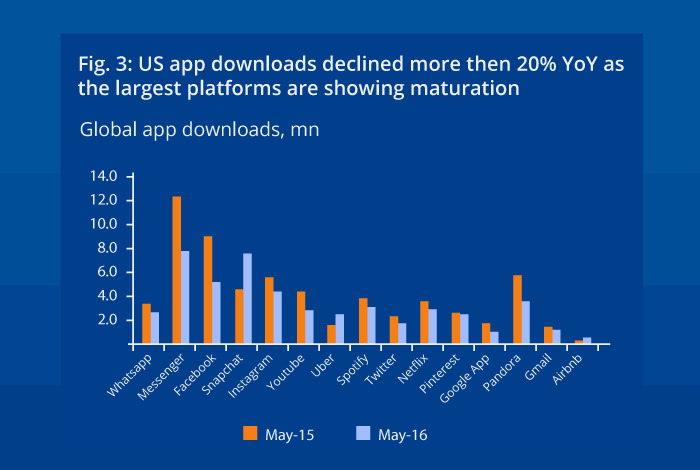 This isn’t to say that people have stopped using apps, or even that apps downloads are down overall. But we should recognize that today there are already apps for nearly everything and everyone. Many people just don’t feel a need for new apps in their lives. Thus, when we think about developing a new app, we must ask: who actually needs it? We know that people want to access information and perform tasks faster, but apps don’t always satisfy these desires. For instance, if you want to book a flight right now, but don’t already have a travel app installed, you’ll first have to spend time downloading an app. And users don’t want to download an app each time they book a trip, buy shoes from a new store, or want to read a new magazine. It’s inconvenient constantly switching among a bunch of applications on your mobile device. 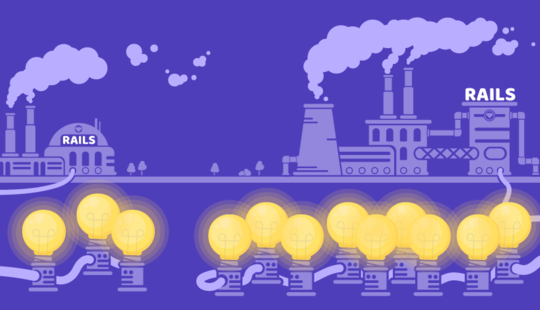 But this is precisely where chatbots shine – you don’t need to download them, and they can solve your problems with less hassle. To use a chatbot, all you need to do is search for a chatbot from within a messaging app and then start chatting. As we’ve already mentioned, people are getting tired of downloading new apps, which gives businesses something to think about. If we Google “App download statistics” in most cases we’ll find out statistics that prove app downloads are okay. But there aren't still many apps in the top charts. According to Statista, there are currently 2 million mobile apps available for iOS devices and 2 million available for Android devices as well. Given these numbers, it’s understandably difficult for a new app to get noticed. 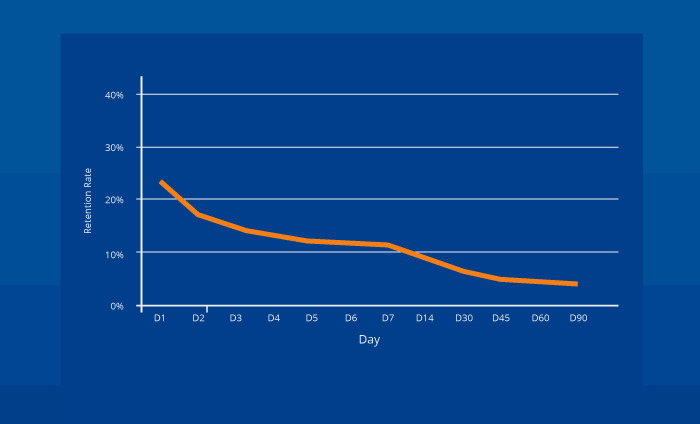 Above is a graph from Appboy showing that fewer than 25% of people who actually download your app will come back to it even just one day after their first use. There are many strategies for successfully marketing an app. You can create a blog or contribute to existing blogs; you can advertise your app; apply App Store optimization techniques; actively write on Quora; and try a lot of other tactics. But you should keep in mind that it will take quite a lot of time and money to compete with apps that are already popular. We must also keep in mind that apps are not websites, and they must constantly be updated. Every year, new OS versions are released, and if you don’t update your app, it will become unsupported on the latest devices and people will leave it. Designs must be updated as well to keep up with the latest trends. Failing to update an app’s design can sometimes be enough to lose users over time. Apps only survive when they’re given constant attention. If you’re willing to compete with all existing popular apps and understand that the path isn’t easy, then you may have a shot. But the good news is that you don’t have to compete with the tops apps on the app store. There’s an easier way. Chatbots let you set up business where people already spend most of their time on mobile devices – in a messenger app. As we just suggested, the easiest way to grow your online business and reach a larger audience is to connect with people where they already spend most of their time. 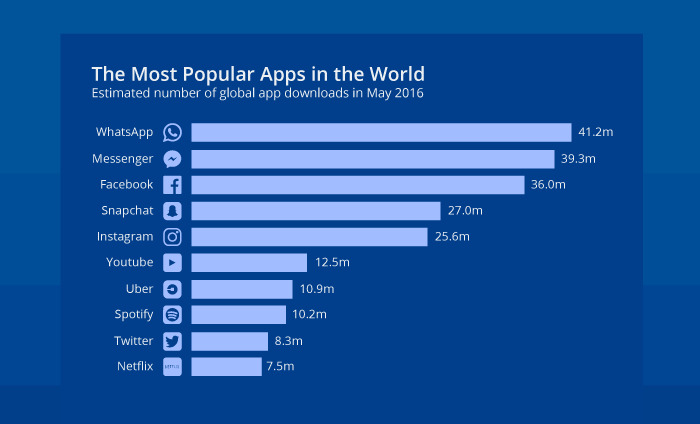 To get an idea of what people do most on their mobile devices, let’s take a look at a chart of the most popular apps today, based on the estimated number of downloads. 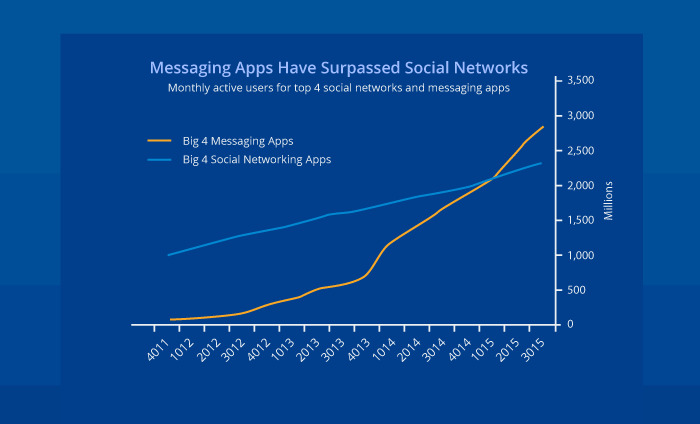 As we can see, people are using messengers more than social networks. And here’s another chart, from BI Intelligence, that indicates that messenger apps have only recently overtaken social networking apps in number of monthly active users. According to these data, chatbots, which run on messenger platforms, definitely have the potential to reach a large audience. And given that most apps are services, it’s quite possible to provide those same services via messenger platforms, without the need for a dedicated app. Facebook’s Messenger, for example, has about 800 million users – and you can reach all of them with a chatbot. Times change, and messaging apps that used to be only for exchanging text messages and picture have now turned into complete platforms with their own developers, apps, and APIs. People all over the world are starting to use messaging apps not only to chat, but also to interact with brands. Brands such as CNN, Vine, Disney, Spring, and Uber already rely on chatbots. Every day, large brands and even small businesses are developing chatbots to streamline their working operations. Chatbots do routine work for you. For example, if a customer wants to buy a pair of shoes, they could go to your shop’s website or app and browse. But they could accomplish the same outcome more easily by just chatting with a bot. That’s pretty similar as talking to a human, but brings value to your business because bots give answers quickly and to many customers. But here you may ask yourself a question: Why do I need a chatbot when I can interact with customers myself? We’ll consider several reasons why chatbots can be the best choice for interacting with customers. Bots can scale more easily than apps or websites. Let’s look at a few scenarios. Imagine you’re a company that provides service, for example you sell shoes, through Facebook. Your customers more often reach you via Facebook Messenger. At first glance, it seems not so difficult to chat with several customers at the same time and tell them all about your service. It’s pretty easy to chat with a handful of people, just as you do with your friends and relatives every day. But what if 100 people message you at the same time and each person has a unique question? You could hire people to chat with your customers, and that would simplify things for you; but why should you hire people when you can build a chatbot? You can configure a chatbot to understand what customers are asking and to intelligently answer them. This automated solution allows your business to handle more customers that it could previously. Bots simplify our mobile experiences because it’s much easier to deal with a number of chatbots than with a ton of apps. When you don’t use a chatbot for a time, it will just get hidden in a pile of older messages. But whenever you need something, it’s there. 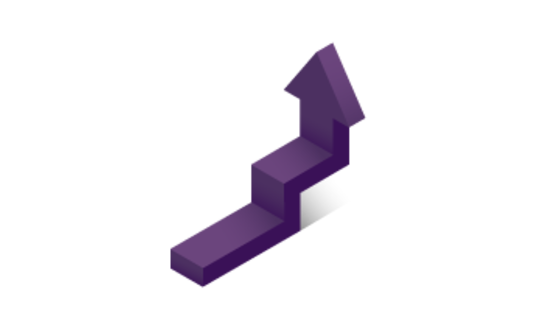 You can scale your business while simultaneously looking out for the convenience of your customers. To develop an app for your business, you need to work with professional iOS and Android developers, ideally collaborating with a strong UX designer. This process – from the start of the project to the launch of your app – will take quite a lot of time and will cost you a pretty penny. Bots allow small business to provide their services efficiently, with lowers costs than native app development. 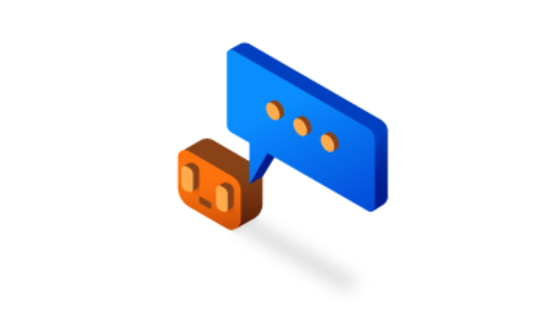 But even if larger businesses have enough money to build a dedicated app, it’s still worth considering a more economical and accessible chatbot alternative. In addition to the difficulties of developing an app, apps have to be tested, refined, and then submitted to app stores for approval before users can access your services. App maintenance can be quite costly and inconvenient. Remember that apps require constant investment to survive. Everything about chatbots, on the other hand, is much simpler. You don’t have to worry about app development, as messenger apps are built by third parties. All chatbots feature updates can be done with continuous integration just to the backend. Ecommerce chatbots help you purchase goods and services, food chatbots can order dinner, banking and trading chatbots can deal with your finances, content chatbots can provide you with content you might be interested in, booking chatbots can book hotels and flights… and the list goes on. As you have probably noticed, chatbots can be useful for any industry. They can help you streamline your business operations and improve marketing and sales. Chatbots can help you promote sales or new products by notifying all your customers. Posting on your website or on Facebook won’t help you raise engagement that much compared to sending the same message by email to all these clients. Chatbots help solve this problem by acting as a personal assistant for each customer. When chatbots first interact with customers, they gather information so they can personalize their responses. These chatbots help customers choose products, process payment information, enter shipping addresses, and complete orders. The process of ordering a product with a chatbot takes much less time than talking to a human, and your customer never has to leave the chat. There’s no need to spend massive amounts of time and money to satisfy your user’s needs. You can grow your business easily with the latest technologies and keep customers happy. Chatbots are evolving quickly, and admittedly they’re still not as clever as we want them to be. Still, they already offer much potential for forward-thinking businesses, both large and small. Thank you for sharing this interesting blog article. Keep up the good work!